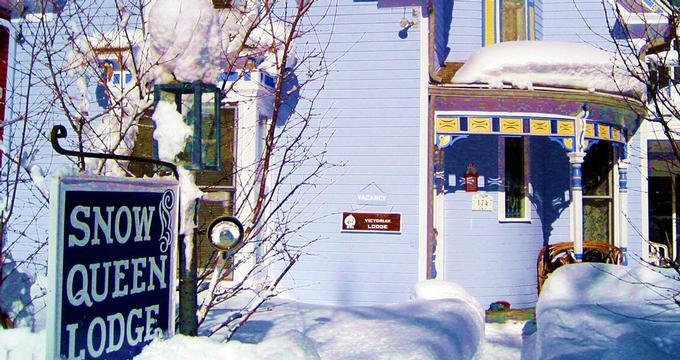 Nestled at the base of Aspen Mountain, the Snow Queen Lodge & Cooper Street Lofts is an inviting, family-run bed and breakfast that offers a comfortable retreat in the heart of Colorado’s ski country. Exuding an elegant Victorian charm dating back to the era in which it was built, the cozy inn features quaint, individually decorated accommodations in the form of guest rooms with private bathrooms, and modern amenities, and loft-style condos with kitchenettes, wood-burning fireplaces, and private balconies with spectacular mountain views. Guests are treated to a delicious country-style breakfast every morning in the dining room, and complimentary hot beverages are available throughout the day during ski season, along with a shuttle service to skiing locations such as the Buttermilk, Highlands and Snowmass Mountains. The Snow Queen Lodge also offers comfortably furnished communal areas in which to relax and socialize and a hot tub with glorious mountain views. The Snow Queen Lodge & Cooper Street Lofts features six beautifully appointed and individually decorated guest rooms in the main lodge and three separate loft-style condos a short walk away on Cooper Street. All accommodations are decorated in a chic contemporary style with comfortable furnishings and have king or queen-size pillow-top beds dressed in high-quality linens, hypoallergenic comforters, and pillows, and en-suite or private bathrooms with shower/bath combinations, make-up mirrors, plush towels, and organic bath products. The loft condos are more spacious than the guest room and have kitchenettes with fridges, microwaves, washer/dryers, and cookware, sitting areas with armchairs and sofas, wood-burning fireplaces, work desks and chairs, and private balconies with mountain views. All accommodations have modern in-room conveniences including flat-screen televisions with cable channels and complimentary wireless Internet. The Snow Queen Lodge & Cooper Street Lofts have comfortably furnished communal areas in which to relax and socialize and a hot tub with glorious mountain views. A complimentary European-style buffet breakfast is served each morning in the dining room (for guests in the main lodge only), and complimentary hot beverages are available throughout the day during ski season, along with a shuttle service to skiing locations such as the Buttermilk, Highlands and Snowmass Mountains. Situated in the heart of Colorado’s Rocky Mountains, Aspen is a ski resort town and year-round destination for outdoor recreation. The vibrant town is renowned for its landmarks like the Wheeler Opera House, which was built in 1889 during the area’s silver mining boom, the Wheeler-Stallard House, a 19th-century, Queen Anne–style home and history museum, and its high-end restaurants and boutiques. Aspen and the surrounding areas offer a wealth of activities for the nature-lovers and outdoors enthusiasts, including world-class skiing, snowboarding, cross-country skiing, hiking, mountain biking, horseback riding, hot air ballooning, fishing, kayaking, canoeing, and river rafting. Cultural activities include shopping, art galleries, museums, botanic gardens, concerts and festivals, and rodeos.